Prepare to meet the challenges of today’s diverse classrooms–and discover the opportunities for professional growth and advancement they provide–with this widely popular, market-leading text. In an accessible, conversational style, this book shows new and future teachers how to apply success-proven, research-based teaching practices that are up to date, practical and realistic for use in today’s diverse classrooms. The material and teaching practices presented are supplemented with examples from classroom videos, written classroom dialogues, and case studies, many taken from years of research and observation of effective teaching practices in actual classrooms. Readers see clearly how to engage students in the learning process, manage the classroom effectively, and increase student achievement. 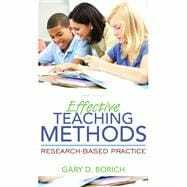 The new edition of Borich’s Effective Teaching Methods helps prepare teachers for the challenges of today’s diverse classrooms through coverage of such topics as Common Core curriculum standards, differentiated instruction, new educational technologies, special populations in the general education classroom, cognitive and academic language proficiency, and new legislative initiatives such as Race to the Top and Response to Intervention. The Enhanced Pearson eText features embedded video and assessments. Gary Borich grew up on the south side of Chicago, where he attended Mendel High School and later taught in the public school system of Niles, Illinois. He received his doctoral degree from Indiana University, where he was director of evaluation at the Institute for Child Study. Dr. Borich is a professor in the College of Education at the University of Texas at Austin and a past member of the board of examiners of the National Council for the Accreditation of Teacher Education (NCATE). Dr. Borich's other books include Observation Skills for Effective Teaching, seventh edition; Educational Assessment for the Elementary and Middle School Classroom, second edition (with M. Tombari); Clearly Outstanding: Making Each Day Count in Your Classroom; Becoming a Teacher: An Inquiring Dialogue for the Beginning Teacher; Educational Psychology: A Contemporary Approach, second edition (with M. Tombari); Educational Testing and Measurement, tenth edition (with T. Kubiszyn); The Appraisal of Teaching: Concepts and Process; and Teacher Behavior and Pupil Self Concept (with M. Kash). Dr. Borich lives in Austin, Texas, with his wife, Kathy. His interests include training and riding Arabian horses and he is the author of An Illustrated Introduction to Classical Horsemanship.